I met Toivo something like two years ago while he was working for a café I used to have my daily coffee-breaks. In the beginning we didn’t say much but you could feel the connection and it was like two boxers in the ring going around trying to measure each other. And then one day during his break we started talking. We talked about politics in Finland, politics in Britain and soon about Greece and Europe. Since then we have become friends meeting often and always talking in a chess mood about politics, environment and life and Finland. 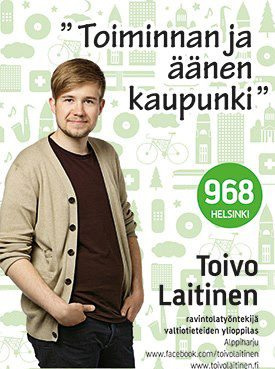 I am a 23 years-old student at Helsinki University in Economics and Social History studies with minor subjects Urban Research and World Politics. My family roots are in Töölö. That’s where I have spent my childhood and most of my life. Nowadays I live in Kallio. Particularly in the area of Alppiharju. During the past few years Kallio has grown immensely as an area. New businesses and happenings have started to appear everywhere and I would like to see more of that all around Helsinki. Even though I have found a home in Kallio and I plan to stay there, my heart still beats for FC Töölön taisto. This moment I am candidate for two elections, Municipal and University – student union – elections. Aside of my studies I work in cafes, restaurants and as a substitute teacher in upper elementary and high school. I’m actively participating in “The Green Voice,” the representative organ of the Greens into the University’s Student Union. Why now, why for the municipality elections Toivo? Municipality elections are as important as parliament elections. Especially in Finland the municipality councils have greater influence in local issues than in any other country. They can decide on everyday life issues, urban planning, transportation, schooling and how health and social services are organised and working. At least in Helsinki, political parties differ from each other greatly. The Greens stand for strong funding to the schools, kindergartens and youth related problems. We think that privatizing the majority of the fundamental public services is an error that's going to cost us gravely now but especially in the future. Saying that public sector can always learn in some areas from their privatised counterparts. For example private schools are more cost-efficient and have better results than public schools. This can be fixed by increasing autonomy amongst public schools and imitate some of the ways that make private schools more efficient. 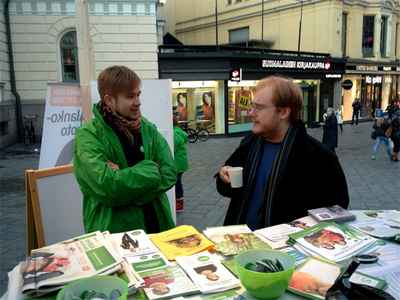 The greens are according to Helsingin Sanomat the most liberal party. We, with the Leftist alliance, are the most eager to increase immigration and stand for the rights of the immigrants. Green Helsinki also stand's for more dense urban structure which is more ecological than dispersed planning. Dense Urban structure also secures effective services nearby the citizen. What do you think has gone wrong with Helsinki the last decade and needs change? 3) Immigrants feel that they are not welcome and have integration difficulties. 5) The City responsible have tried to wield cultural life and night-life into their own purposes and agendas instead of creating a more lively city in cooperation with the citizens especially the youth, artists and organizations. 6) Lack of housing has not been responded by any effective means. 7) Areas have become more segregated and boundaries between social classes have started to form more visual even in the habitual areas. 8) Cycling boom hasn't been fully answered with infrastructure. What is your main issue for these municipality elections? To bring the cultural life into it's full potentials by decreasing control and reducing rents in public spaces. Night traffic doesn't really exist in Helsinki. Cycling is overlooked in budgets, insufficient funding. We need to get rid of the car-dependent life-style and start building self-sustaining areas full of apartment buildings. The number of immigrant candidates is of course welcoming. The Greens have also thoughts and suggestions about the election system. If we have too much immigrants in our electoral lists the votes get too divided amongst them and any actual possibility of one of them getting through decreases. Immigrants should vote and show their power in strength; otherwise their interests get undermined in the city council. Actually in democracy this it the only way of getting really represented when you vote for people who can really represent your needs, hopes and dreams even if you didn’t born in this country. To get inside the city council and get as many votes as possible for the Green party. Then we can actually make a difference! Indeed, as Aristotle points out in Ethics, one of the three essential components of flourishing life is that of friendship which he saw as similar to family. What would we be and what would we do without our friends with whom to share ultimate values? While Cycling through the cycles of your Life, you increased the circuity of your Life's Cycle by adding a Good Friend. Yes Sir, that's what Life (and its Cycling Cycles) is all about. Also, the creaks, cracks, groans of moans of Civilization can be heard everywhere around the Globe (tectonically speaking). As ever, Sir, you are Open and Astute. Thank you for this Sharing, and introduction to Toivo.